El Greco’s painting and the story to which it alludes speaks to the attraction and potential danger of the public display of anger. On the one hand, I can very directly relate to the urge Jesus is giving voice to. 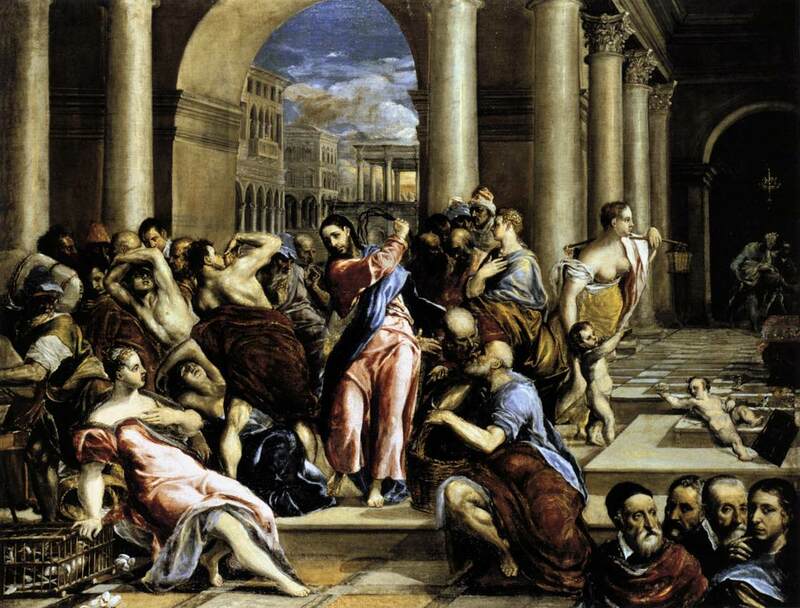 On the other, obviously, we wouldn’t have much of an orderly public world if everyone could just go around metaphorically knocking over whatever figurative money-changers’ tables we encountered. (I guess another example that works here is Homer Simpson’s brief discovery of demanding satisfaction and the “glove slap” – one only gets so far before the old man who says “sihhhr” and demands “pistols at dawn”). The image, of course, depicts a nonverbal act of anger, but one of the reasons it works as art is that is speaks to an ambiguity that is inherent in speech acts as well as other non-speech ones: one wants to say it’s acceptable, even necessary, to feel and express anger at certain times, and in public, but one also wants to say that’s not something you should just do every day, or even very often at all. So when should you? Anger being such a concrete emotion, and the question being so abstract in nature, it’s difficult to answer. I’m tempted to adopt a “I know it when I see it” sort of answer, but then, that’s obviously question-begging. Obviously I’m exaggerating but the issue seems to be – anger is something we’re likely to say should be overcome in pursuit of something like respect for others. It’s not acceptable to disrespect someone else even if you feel very strongly that their actions are wrong. Speech-acts delivered in anger generally involve disrespect, therefore such speech-acts are wrong. I don’t profess to have a great argument to the contrary, but I will say I have very strong intuitions to the contrary, and those intuitions aren’t things I can easily set aside in some sort of reflective-equilibrium-type process. I’ll try to set them forth. My reaction to the El Greco? I don’t look at this painting and think “Jesus should not have done that.” I’m guessing that’s not how many people (Christian or otherwise) see this painting. When I watch interviews with Malcolm X, I don’t think “he would have been much more successful if he had just mellowed out.” When I read pieces by Jonathan Franzen, I don’t think “that guy should just get over twitter and be happy.” When I read a letter by Ezra Round, I find something satisfying in its vitriol. Socrates’ contempt for the jury and his sarcastic proposals for alternate sentencing after they convict him make me laugh. I recognize that my embrace of these various angry personages has an obvious explanation: I too am too angry. Just like Nates takes issue with my enjoyment of Pound’s letter, it took about 10 minutes for Twitter to strike back at Jonathan Franzen. And Malcolm X’s reputation precedes any study of his ideas. When we read Socrates in my high school class, many students are glad when he finally dies. Still, there’s a part of me that wants to say “when you’re right you’re right, regardless of the mode of expression you’ve selected” or more strongly “when you’re right you’re right and sometimes you need to to get anyone’s attention.” A memorable example in this respect comes midway through Spike Lee’s Katrina documentary: then-mayor Ray Nagin goes on the air on a radio show and starts yelling about how no one is helping his city. One wants to ask what else you can reasonably expect from such a person in such a situation. That makes it sound very instrumental in justification though – like if anger works, it’s okay. It’s probably true that anger sometimes works, but that’s not the sort of defense I’m looking for either. I feel like the real explanation lies somewhere behind the cliche “if you’re not mad, you’re not paying attention.” What all of these acts of anger have in common seems to be the strident revelation of hypocrisy. Martin Luther King’s negative-positive peace distinction (it’s probably not his but he does use it) “a positive peace which is the presence of justice” vs. “a negative peace which is the absence of conflict” feels relevant here as well. Maybe that’s where the argument for anger needs to start: with a critique of the very notion of “anger” in the first place: we’re accustomed to label as “angry” behavior that produces conflict. But a couple of the examples I’ve cited above are examples where an underlying absence-of-justice is more important than the absence of conflict it disrupts. If Malcolm X does some yelling, he’s also yelling about something that we’ve all just become accustomed to a form of structural violence that his yelling brings to the surface. Blaming him for being violent becomes a convenient rhetorical justification for continuing to ignore the very violence that his speech is highlighting. That’s the power of the Jesus example: sure, he’s turning over tables, and sure, that seems bad, but, I want to say, “THEY’RE MONEY-CHANGERS AND THEY’RE IN THE TEMPLE!” The money-changers may be “civil,” but so are all white-collar criminals, and so were many segregationists and Nazis. But if their civility is in the service of a violent system, their civility hardly counts as a good thing. There is no virtue in their civility if it serves as a rationalization for exclusion and injustice. So there is consequently no problem with anger in such a situation either. But then, we need to be sure injustice is involved. That’s a whole other issue, obviously, but if there is, if the angry party really is right, there’s no real problem with it. Of course some of the best arguments against anger all rely on the likelihood of someone’s being wrong. The idea is – be civil because your interlocutor might be right. But what about when you’ve actually done all the work necessary to prove to yourself that they’re not? You’re a slave on a plantation being forced to do inhuman labor – are you wrong to yell about it? Probably not. But all the normal anti-anger cliches apply here, right? “Your owner is a person too.” and so on. Still I’m inclined to side with the slave. So a couple of provisional conclusions. Speech-acts we label as “angry” are often just things we don’t want to confront. Anger seems justified when it’s rhetorically effective and the underlying cause is just. It’s probably wrong when it’s not. One last bit – I do agree with Nates that we quite often find totally out-of-proportion expressions of anger and misunderstandings that begin from anger in contemporary political discourse. I think this has a lot more to do with the medium of those communications than any issue with anger per se. The internet has become the site of a million microaggressions (and consequent microaggressions about microaggressions) a second. Think of all the posts in your feed that essentially say “can you BELIEVE what [this guy you’ve never heard of] said about [a group you allegedly care about]?” Temporary outrage seems to work well to generate clicks. But none of the examples I’ve given are about that – such click-bait just seems to be a set of cases where the cause is not just. If it were – and it were truly thought out, like I take Franzen’s, Malcolm X’s work, for example, to be, I don’t see the problem with it. Yes, I agree with a lot of what you’re saying here–most of it, really. In particular, I agree with the idea that anger can be quite appropriate and effective at the end of a process of inquiry, when “you’ve actually done all the work necessary to prove to yourself” [that you’re in the right]. And I also agree that there’s a sketchy way of avoiding dealing with important institutional and social critiques by dismissing them as angry. So it looks like our common target is (quite reasonably) overhasty anger that clouds one’s judgment. Now it just becomes a question of what (and how much) behavior fits that description. There are the obvious candidates: TV news and the internet comments we’ve both mentioned. Also, the Kant-conceptualism debate takes on a surprisingly personal tone. We’re all emotionally invested in our positions, just from the sheer amount of time we’ve devoted to defending them. As a result, I sometimes catch myself questioning the intellectual character of people who would read Kant in such a stupid way! In the end, the emotionally-charged character of the debate is harmful to everyone involved. I’m sure I don’t read my opponents as charitably as I should. And, worse, I don’t think I read Kant as accurately as I should. I’m too dismissive of the bits of text that are problematic for my view, and I’m too quick to interpret ambiguous passages in ways that favor my position. What I’m trying to get at is this: it’s not just about big outbursts of anger on the internet or TV. Even a kind of low-grade frustration can be epistemically-distorting. It’s very hard to avoid, and thus I think it’s vital to become more self-aware of its influence. And now I’ll take the risk of getting a little personal. What spurred our recent conversation on this topic was our original exchange on Libertarianism here. I was challenging your critique of Libertarianism, and I was perplexed by your response to this challenge. There was no outburst of anger on your part, but there did seem to be a kind of frustrated dismissiveness. I found that you were repeatedly interpreting my claims in the worst-possible light, as if you already knew my position was wrong and simply had to identify the problems. I’m sure some of this was due to my own lack of clarity, but I don’t think this entirely explains our failure of communication. Some of it struck me as being the result of the same epistemically-distorting emotions that I’ve described above with my Kant scholarship. At the time, I wasn’t thinking about my work on Kant at all. But I did connect your reaction (as I interpreted it) with my own experience of being overly dismissive of political views I disagreed with. Reflecting on this general phenomenon has led to our ongoing conversation on anger, the principle of charity and so on. I think we’ve made some headway here. We’ve certainly staked out some useful boundaries. But I’m not sure we agree yet on how widespread the problem is. The academic example is interesting because you’re definitely right that it’s easy to target the internet and the news. Those examples are not only too easy, they’re also self-serving. We (academics and would-be academics) can say “See, those people, they’re irrational and yell all the time, but we’ve got this whole detached rationality thing going on so we needn’t worry about this sort of thing.” As so often, otherization is one the best and most misleading sources of self-assurance. Two things about those academic examples. First, a preference I have: I actually quite enjoy reading the sort of polemical exchange that you’re referring to. I haven’t read that part of the Kant literature so I’l give another example (one I blogged about before). I read a whole sequence of arguments and replies between Gregory Nagy and Martin West about the authorship of the Iliad. There was spirited back and forth, and even a few ad hominem attacks. It may be that I enjoy this sort of thing because I’m not actively involved in it. I also find spirited debate more interesting than bland parsing of prose. Still you may object that as much as it’s enjoyable to read, it’s intellectually misleading for the participants. I do agree that anger can cloud one’s judgments and understanding. I’m not ready to say that’s what happened in the dispute about litertarianism and the civil rights act. I think there is also a space for honest disagreement and interpersonal confusion even in a non-anger-bearing argument. The more sure you’re right, the more you’ll attribute that misunderstanding to someone else, but it’s a bit hard to evaluate one’s self in this respect. It’s awfully meta. But I do agree anger can cloud judgments. I think, though, there is another, productive role anger plays in such disputes. Upon reflection on the libertarianism and civil rights discussion, I realized one of the sources of that anger I was definitely feeling. About 60% of my high school students are black. This is a community that has undergone what’s euphemistically called “democraphic change” in the last 20 years (for a long time the community was 15% black – startig 15 years ago many white people moved out to new nearby exurban housing developments, and many more black families moved into what remains essentially a middle-class community. It’s very hard to have an honest conversation about this with many of the white people who moved out, because they’ve left, and usually have weird rationalizations about why they did rationalizations which avoid race, as you might imagine). Anyway – I realized I was experiencing anger about the hypothetical nature of our discussion about the Civil Rights Act in the context of my work and my interaction with my black students. It felt intellectually irresponsible to be wondering aloud whether there should ever have been a Civil Rights Act or not, because I’ve listened to students tell very real stories about their experience of discrimination, both at the hands of government authorities and private citizens. I even had one student whose relatives had been slaves in the 1930’s in a pocket of Mississippi that somehow hadn’t really been purged of the practice. All of that made me think – you know, maybe the existence of civil rights legislation is more of a hypothetical issue to a few well-off white males arguing about it, but is far less hypothetical (and far less negotiable) among the populations it more directly affects. Now this doesn’t mean there’s not a good-faith argument to be made about how it hurts that community even if they think it helps them, but it does mean their perspective was missing from our conversation. And I was mad about that. It reminded me of another incident. Two of my debaters (one of whom was black) had been debating against two white opponents. This was a high-profile debate, with probably 20-30 people watching, and the result was very important for both teams. The two white opponents were making Malthusian arguments about overpopulation vis-a-vis civil (and other) liberties. The context is tricky to explain but the gist of the argument is we need more authoritarian forms of government because individual rights lead to unsustainable over-consumption. Probably not the best argument – and the fact it’s about libertarian and statist solutions to things isn’t really relevant either (even though I know that’s what we were arguing about). The relevant aspect of the situation was – my debater who was black said something like “so if slavery had been better from a resource management perspective, you think that makes it okay?” A member of the other team says “yeah, I guess so” with a smirk, and a good portion of the audience (like 95% of whom were white) laughed. My debater was extremely upset, and lost the debate. This is definitely a case of anger clouding his judgment. The debate could have been won by our team had he been able to recognize and point out some simple logical connections, but it wasn’t. Even 2 hours later, he was still extremely angry about it. So yes, it clouded his judgment, but I think it also showed him something about the rhetorical situation he was in, and the role that white privilege played in it. His realization of his own anger thus helped provide an important intuition – that Debate was a very white-male-dominated activity, and that that was a problem. Had he not gotten angry, I’m not sure he would have seen things in that way. But even beyond that, his anger seems like a valid response even if it did cloud his judgment and even if it hadn’t produced that perspective on racism in debate. I wouldn’t want to take that reaction away from him or say it was counterproductive. So overall what I’m saying is that anger might alert us to important intuitions, and though that might at the same time cloud judgment, it’s an open question, seemingly only determinable on a case-by-case basis, whether anger in a given context is helpful or not. My own intuition is that academia sometimes undervalues the role that emotional commitment might play in discovery of important truths, and might over-value the (also true) observation that it clouds judgment. And so we come back to where I started – there is a form of self-assurance about anger and emotion within academia that might be bad. It might insulate academics from thinking about the role emotion is playing within an argument, and that might make people (a) unable to see it at work and unable to realize judgments are being clouded, and (b) unable to grasp its benefit in the form of helpful intuition formation. Well, we seem to have attained some common ground. At least enough to make further debate seem pedantic on my part. So, I’m suppressing my desire to nit-pick over a few details, because I mostly agree with everything here. Maybe at some point we can have a conversation about the qualities of good academic prose. (I suspect David would also find this interesting too.) It would be a sad result if my proposed interpretive constraints led just to more bland academic writing. I guess I want spirited but fair, but that obviously needs spelling out.